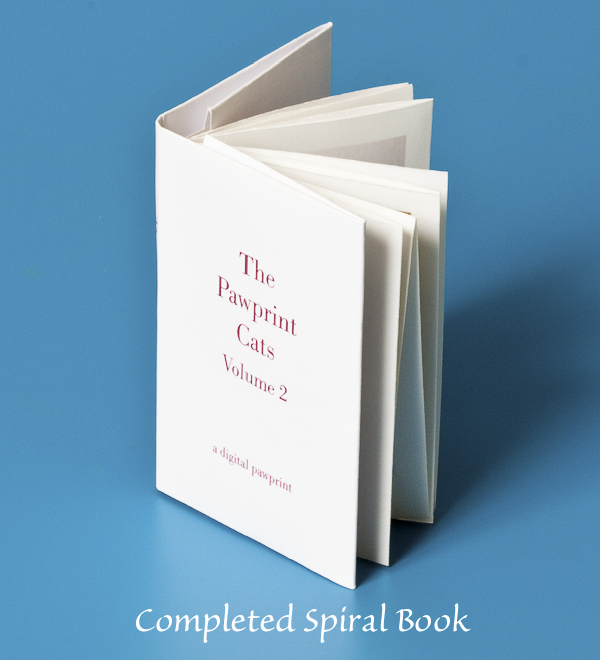 Miniature Spiral Books are small books printed on one side of a single sheet of A4 or A3 paper which is cut and folded in a spiral form to give a small book. 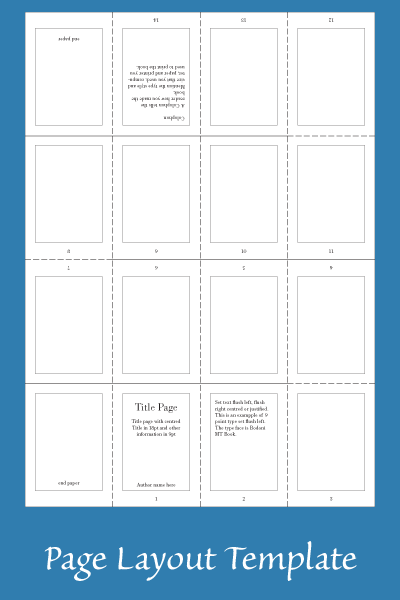 This article describes how a 14 page book can be produced on a sheet of A4 with a page size equivalent to A8. I first came across this method of book making in 2000, in an report printed in the newsletter of the Photo Imaging Education Association, of a presentation given by Al Rodrigues at the Las Vegas PIEA Convention. At the time Al taught photography at the San Diego School of Creative & Performing Arts. My thanks go to him and PIEA for making this information available. Making up the template is the time consuming part, working out margins and positioning of text. 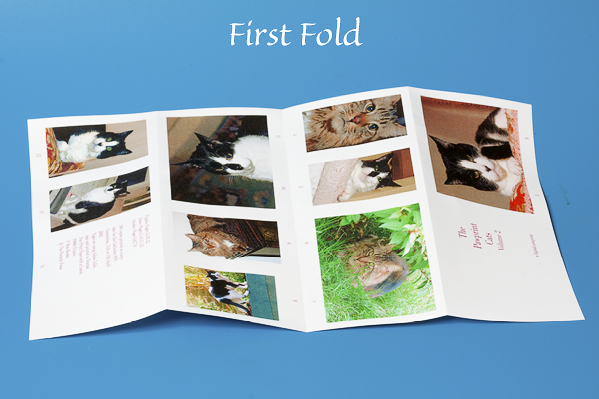 In this case we are dividing the A4 page into 16 with an area for text or pictures on each page plus the page number. The type of printer being used needs to be taken into consideration as not all printers will print edge to edge, which will mean part of the text or image will be cut off if too close to the edge. You may find it easier to leave off the page numbers thus giving a bigger margin around the edges of the paper. These days most ink jet printers allow borderless printing but check the settings as they often default to enlarging the image to create a bleed; we need to print same size without bleed. Once our template has been made we can place our text and/or images. Remember the second and fourth rows (pages 4-7 and 12-14 need to be upside down when wiewed . 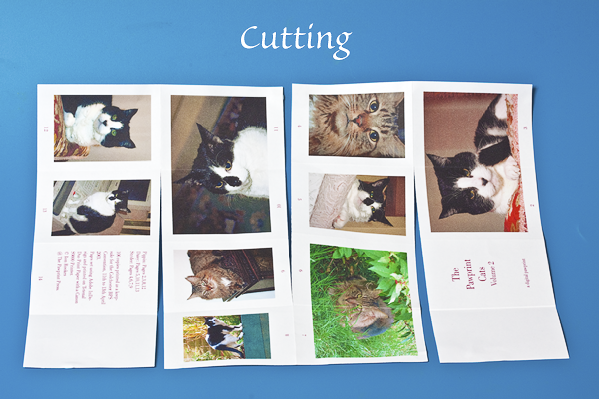 If needed up to six images can be used as double page spreads. The sheet is folded top to bottom along the short edge and then top and bottom edges to the centre. Then unfold and repeat the process along the long edge and unfold again. This divides the page into our sixteen mini pages. 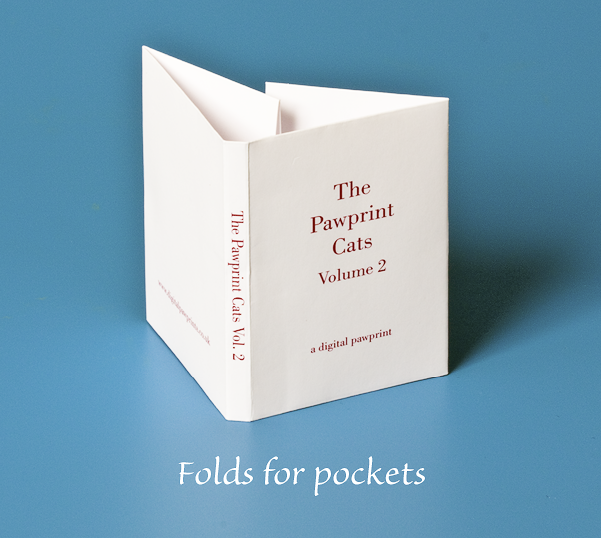 Cut along the folds, in this case parallel to the short edges only as we are making a portrait book, but remember that pages 3 & 4, 7 & 8 and 11 & 12 must remain attached to each other. Lay the sheet down with the title page at bottom. 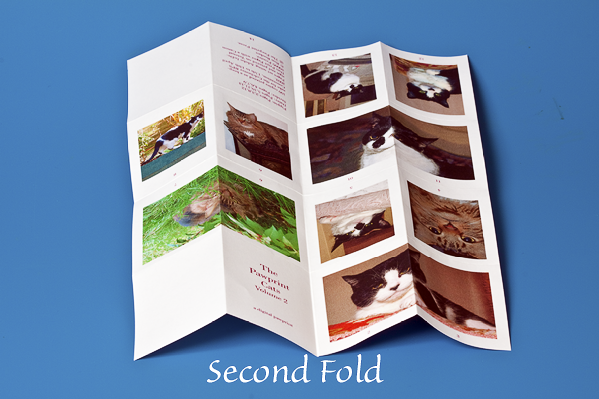 Fold the front end paper over on to the title page and then continue with the other pages in a zig-zag fashion and the booklet takes shape. 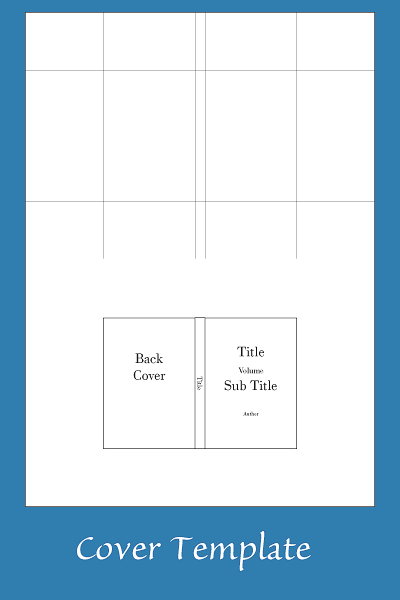 The cover uses a half sheet of paper but the template is laid out two up showing both sides and printed work and tumble. Fold and/or score along the lines printed on the back. Fold the top down and the bottom up giving the height of the cover. 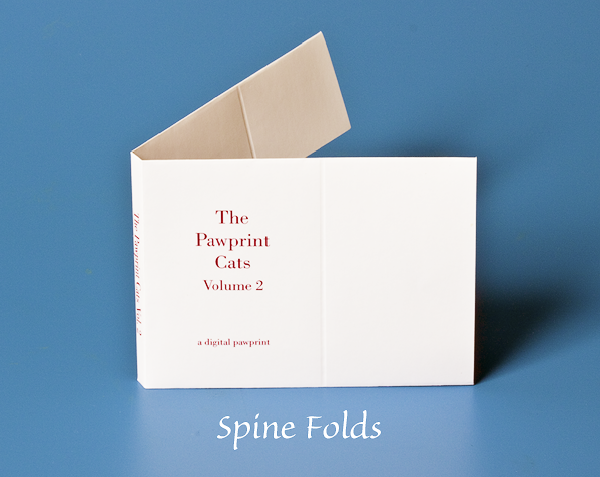 Make the two folds to form the spine and fold the two ends in to make the pockets for the end papers. You now have the completed cover. 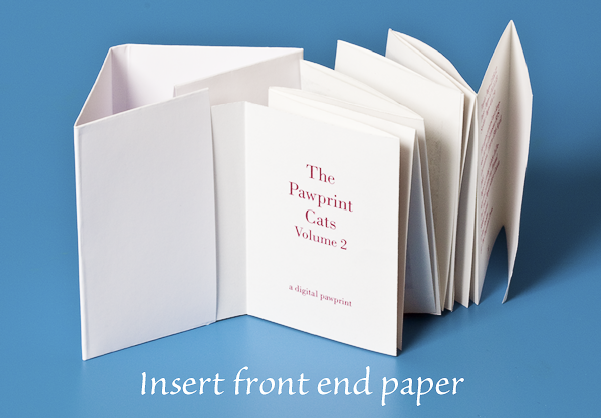 Take the front end paper next to the title page and insert into the front pocket of the cover. 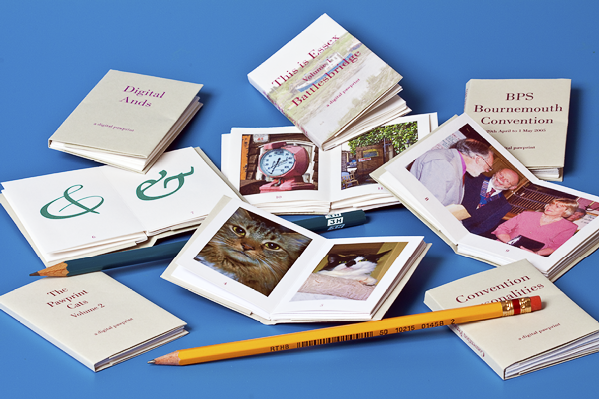 Insert the back end paper into the rear pocket, you should now have your first Spiral Mini-Book. Templates are in a single .zip file and will need to be extracted. File formats are for Adobe Indesign (.indd), Adobe Photoshop (.psd) and Adobe Acrobat (.pdf) and include page layout and cover templates. Click on the pointing hand to download.